For your convenience, PLAY offers e-gift cards that you can purchase onlineand deliver instantly by email, as well as physical gift cards that you can purchase at PLAY. 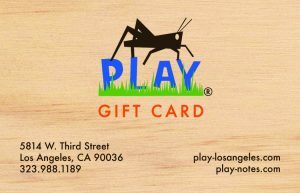 Gift cards are available in any dollar amount you choose and can be used toward any purchase at PLAY–including retail items, snacks, drop-in activities, and session-based classes at our home in Mid-Wilshire and at our Silverlake Conservatory location (enroll in person or by phone to apply your gift card toward class sessions). Purchase an e-gift card HERE. 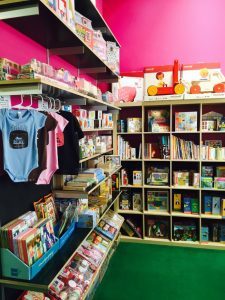 We carry a hand-picked selection of wooden & modern toys, family music, children’s instruments, books, and art supplies for kids from birth to six, including products from Haba, PlanToys, Mudpuppy, Kid-O, Hape, Janod, Melissa & Doug, Chronicle Books, Remo, Hohner, and more. PLAY music members save 10% on all regularly-priced merchandise at PLAY. We also send occasional special offers to folks on our mailing list. Visit the home page for our hours (upcoming holiday closures).